The band you choose can make or break your party. Third Season Jazz will add atmosphere, energy, and a vintage feel to your event - all without blowing the roof off with too much volume. We’ve worked with many companies in the southern California region including Sharp Healthcare, World Emergency Relief, Louis Vuitton, San Diego Gas & Electric, Boeing, The Timken Museum, Novo Nordisk, Ferrari/Maserati of Newport Beach, members of the U.S. House of Representatives, and more. Our band-members are the top-call players in the area and take pride in our musical-artistry. We are always timely, well-dressed, and professional. This was a very special weekend for our clients and you added the perfect ambiance to our evening. You have such a talented group and I am still getting compliments from all of our guests about how wonderful they were. They were very accommodating to my client's need and for that I appreciate them[...] I would recommend this band to others, as a matter of fact we are using them again for an event in August. 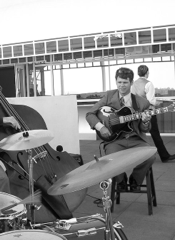 Our most popular group for corporate and networking events is the saxophone/piano/upright bass trio. It has an elegant sound and is not overpowering for a medium-sized group of guests. For some audio samples, click ‘Music’. We also offer a traditional jazz quartet (with a drummer) as well as larger ensembles with vocals if you are planning a big party. Please email us and we’ll help find the best group for your event! For a corporate banquet, a networking lunch, dinner party, anniversary, or special occasion, let Third Season provide the perfect soundtrack. I would recommend them for any event in the future. Our company will use them again if we find ourselves in San Diego in the future. They were perfect for our occasion. I will continue to use Third Season for future corporate events.